You are here: Home / Fun Photos & Events / Preschool Puzzle Time! Playing with puzzles challenges a child’s thinking and exercises their minds. 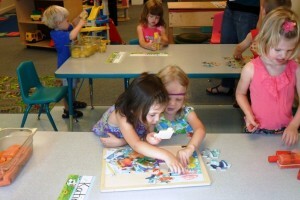 Puzzles are an education learning tool for toddlers and young children as they provide many skills. 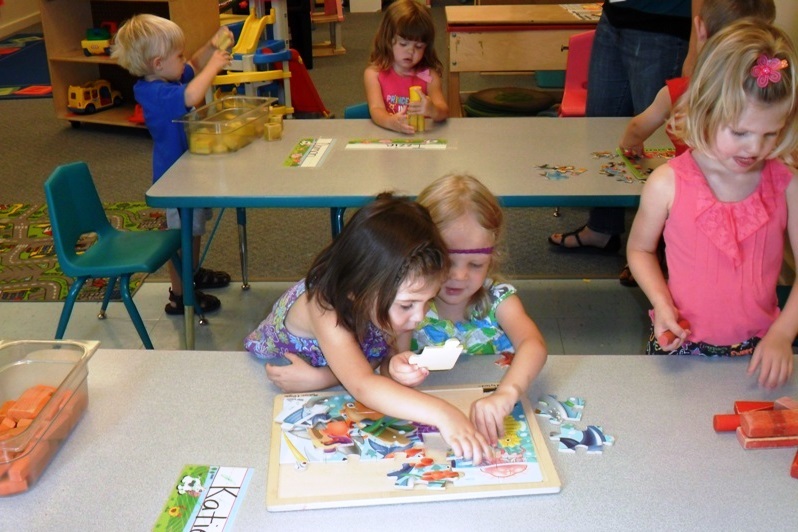 Puzzles help preschoolers with cognitive skills, problem solving, fine motor development, hand and eye coordination. Solving the puzzle boosts their self esteem as they have achieved a goal. Puzzles are a fun educational toy that challenges young minds, teaching and preparing children early in life important life skills. Watching the children enjoy puzzle time at Brandi’s Place is always a fun time! 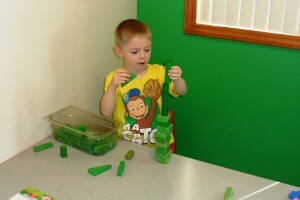 Building Blocks is Fun at Brandi’s Place! Another great learning tool used at Brandi’s Place is the use of block play. Preschoolers love playing with blocks! In addition to developing motor skills and hand-eye coordination, block play can also help foster creativity, enhance problem-solving ability and build other cognitive, emotional and social skills. Preschoolers enjoy blocks as they learn the challenges of balance, understand how blocks fit together, and try to create elaborate buildings and structures. Shapes, colors, sizes, problem-solving, sharing and cooperation. Playing with blocks has the cognitive benefits of learning shapes, sizes and colors, as well as problem-solving. Playing with blocks also offers the creativity benefits of developing their own designs, the social benefits of playing together in groups, and the physical benefits of improved dexterity and hand-eye coordination. Brandi’s Place prepares each child for their school age years and offers many programs to aid in a child’s learning. Blocks, especially wooden blocks are standard equipment in a Creative Curriculum classroom. Bright, colorful, and simple, yet so they inspire so much fun and learning!